Ferrari factory original 1984 Ferrari Testarossa Brochure. 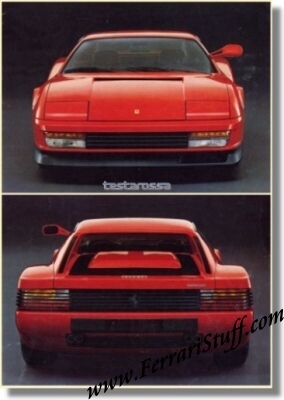 This Ferrari brochure folds out to 4 panes dealing with the Euro version of the Testarossa. It measures approximately 9.5 x 13.5 inches which folds out to ca. 19 x 27 inches. Languages: English + French + German. Ferrari Print Number 326/84 10M/12/84, issued in 1984, printed in December 1984 by Stampa Arbe, Italy.